This was just what I needed this morning! Actually this Skillet Strata with Bacon is perfect for any morning of the week! So easy and made in one pan! You can use up extra vegetables or any meat you like! This Strata turns out beautifully every time! There is nothing better then waking up to the smell of bacon! Well, alright, there are a few things that are better but overall bacon is always up near the top of the list! Regardless, this was a great start to my day! 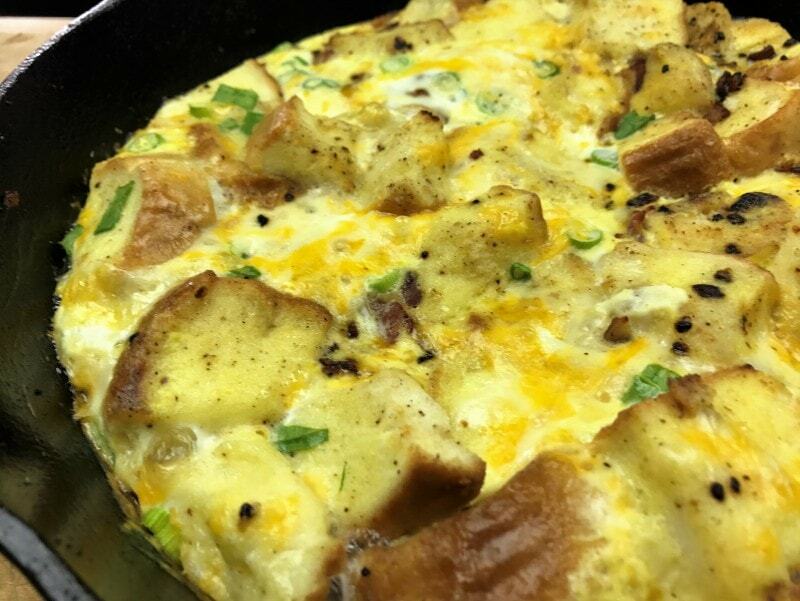 This recipe for Skillet Strata with Bacon can be your perfect start to your day as well! 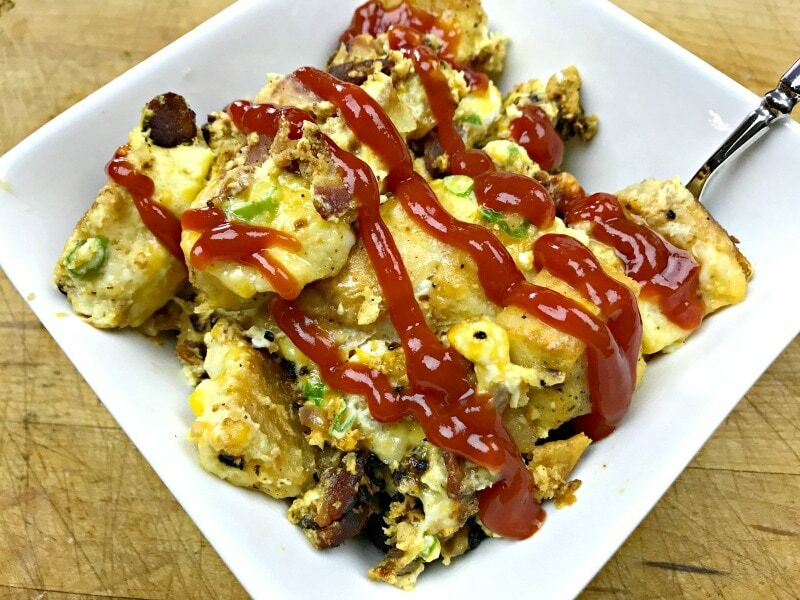 Eggs, bacon, and whatever vegetables you have on hand make this an amazing choice for breakfast or brunch! 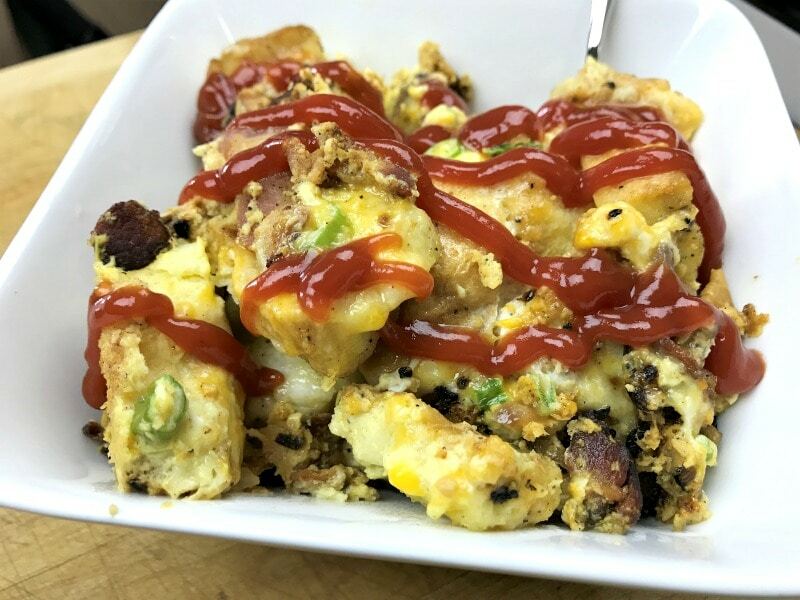 Use this technique and you will create a delicious Skillet Strata with Bacon to start your day off right! Check out our video! Preheat your oven to 425 degrees. In a large bowl, using a handheld or stand mixer, combine eggs, milk, green onions, and 1/2 teaspoon pepper. Stir in cheese. Set aside. Cook bacon in your skillet until crisp. Reserve some of the bacon grease to cook your onions. Allow bacon to drain on paper towel. Set aside. Add onion and 1/2 teaspoon salt and cook until tender, about 5 minutes. Add garlic and stir. Then add bread and using a rubber spatula, carefully toss bread into bacon and onion mixture until evenly coated. Cook, folding occasionally, until lightly toasted, about 3 minutes. Off heat, fold in egg mixture until everything is coated in the egg mixture, especially the bread. Gently press on top of strata to help bread soak up egg mixture if necessary. Transfer skillet to your oven and bake until the center of strata is puffy in the middle and edges are brown. The edge will pull away somewhat from the sides of your skillet, between 12 and 15 minutes, rotating skillet halfway through baking. Let strata rest for 5 minutes in your pan before serving. Enjoy! We believe this recipe originated with America's Test Kitchen. My late friend Marcel was a huge fan, as are we! We have adapted it over the years to suit our own tastes. You can easily adapt it as well to suit your tastes as well!